Reports in parentheses the current number and sets the degree of the curve. Degree in Rhino can be up to 11. Point count and Degree values change automatically to fulfill the minimum requirement of Point count = Degree + 1. For example, when Point count=4 and Degree=3, reducing Point count also reduces Degree; increasing Degree also increases Point count. In closed curves/surfaces, the start and end points are overlapped and counted as one. They have one less point than open curves/surfaces. The new curve matches the input curve end tangents if the curve is open, the degree is two or more, and the point count is four or more. 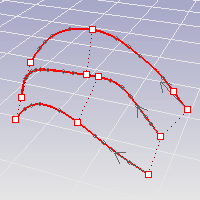 Rebuild a curve to match another curve's parameter structure. The Loft, Sweep1 and Sweep2 commands create a better surface from section curves with the same parameter structure. Reports in parentheses the minimum number of spans and the proposed number of spans. Reports in parentheses the minimum number of spans and the proposed number of spans in the u direction. Reports in parentheses the minimum number of spans and the proposed number of spans in the v direction.